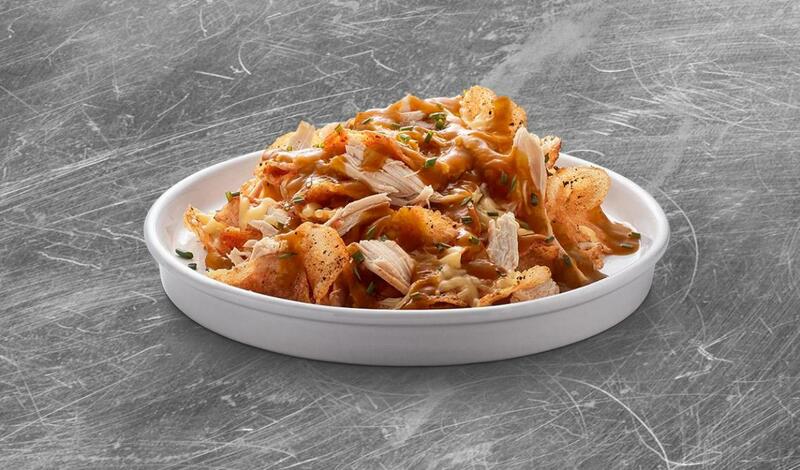 Crispy kettle chips loaded with diced, smoked chicken and shredded smoked Gouda. Served with a drizzle of smoky gravy and a sprinkle of fresh-cut chives. Season the prepared Knorr Brown Gravy to taste with salt,black pepper and paprika; reserve warm. Top (3 oz.) chips with (1 oz.) cheese and place under salamander or in hot oven until melted. Add (2.5 oz.) warm chicken and (3 oz. ladle) smoky gravy.